Custom Wall Decals. Design it Yourself. Apply it Yourself. Quick and easy with our online designer. 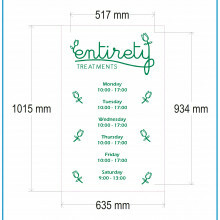 Bespoke wall decals, cut-to-size and cut-to-shape. 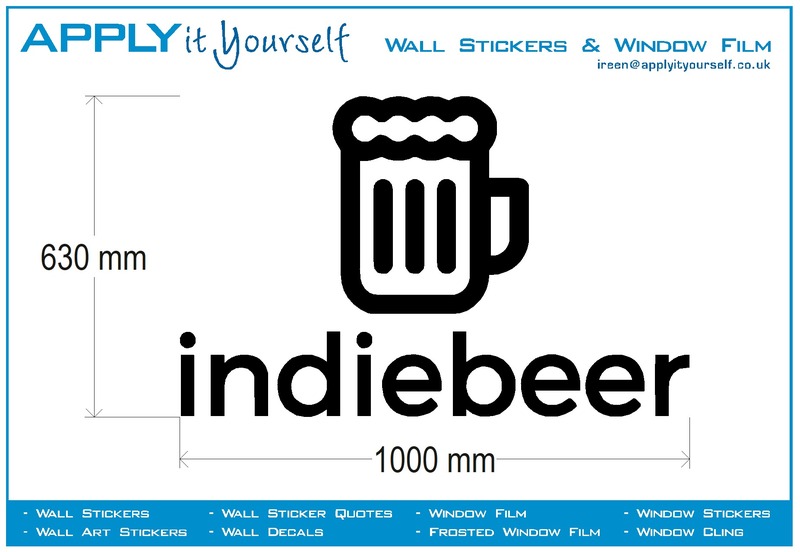 Design your own unique wall decal (with your logo, name, quote and/or other texts) quick and easy with our online designer. Unique bespoke wall decals DIY. Easy to apply yourself without bubbles. Your own wall decal design will perfectly fit with your business (office/restaurant/shop) and/or personal needs (home, front-door, living room wall, bedroom wall). Your own unique high quality wall decals. In 3 easy steps. Design it yourself. Design your custom wall decals to perfectly fit with your house, business, architecture, brand or corporate image. 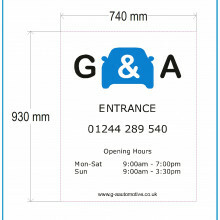 Our made-to-measure wall decal solution are made of high quality vinyl and will arrive pre-assembled in a sturdy box. Ready for application, no additional work is required. Apply it yourself. Easy application. Due to the high quality and bubble free characteristics of our vinyl, your bespoke wall decal is easy to apply yourself. Our wall decals can be applied to both indoor and outdoor walls. Comes with free squeegee, no additional tools required. 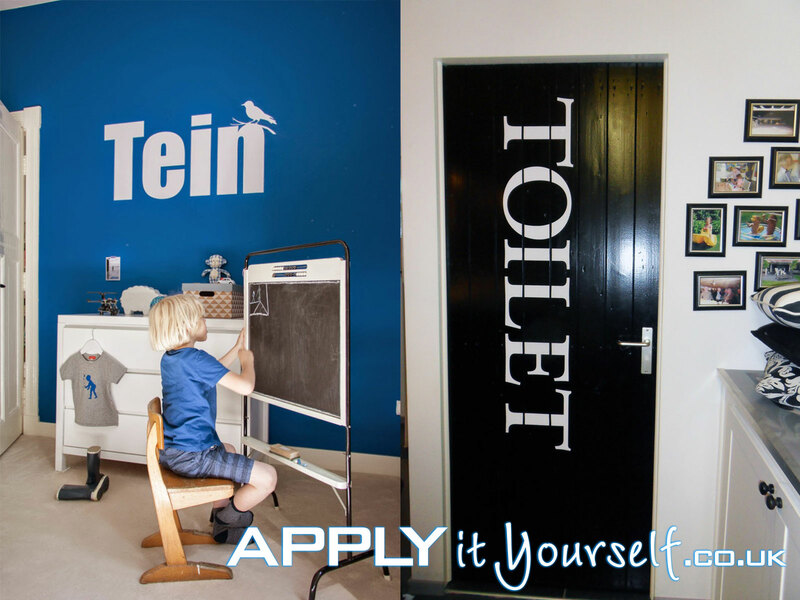 Watch our informative instruction films to quickly learn how to apply your wall decal yourself. Design your own unique wall decals in any colour, shape and size. 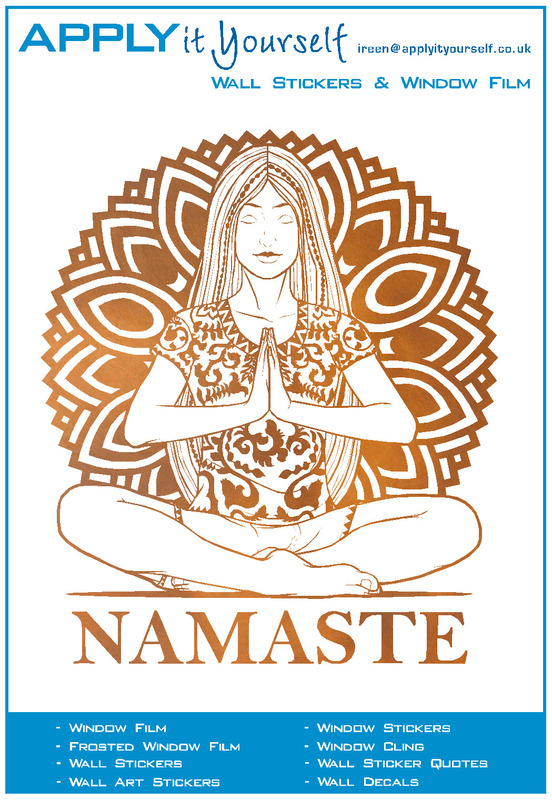 Wall decals with your own unique designs, name, texts, logos, artwork, images and style. 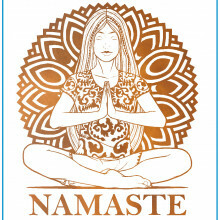 Below you will find our online designer, which you can use to design your own custom wall decal. We advise you to use a PC/MAC or a tablet in landscape mode when using our online design software. Enter the required size in mm. We advise you to first watch our instruction video, and read the instruction, located below the online designer, on how to design your own bespoke wall decals. Here you can upload your own vector designs as a .svg/.eps/.ai/.pdf file. Use just a single colour for your design. See the list of available colours in the online designer. Convert fonts to outline! Avoid the use of small objects! The smallest object (a dot) needs to be at least 5mm x 5mm. Lines need to be at least 3mm wide. 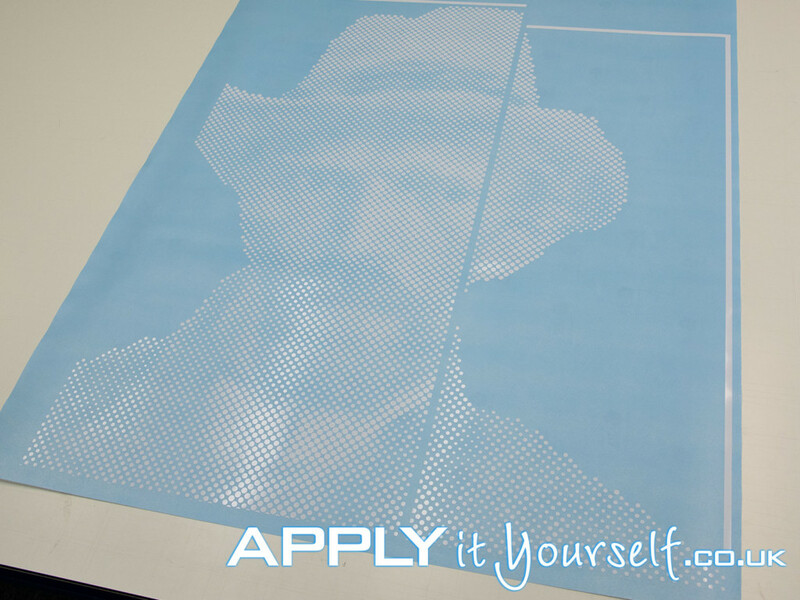 If your design does not adhere to these specifications, your design will be printed on a rectangular wall sticker instead of a cut-to-shape design. 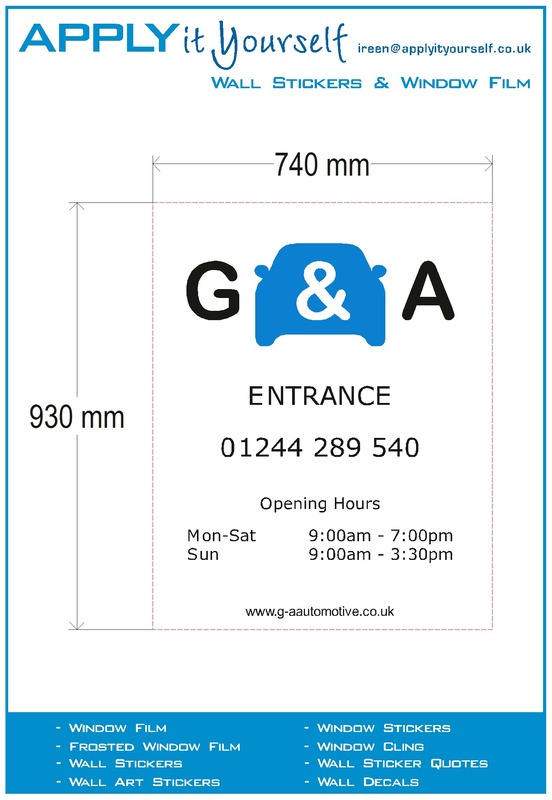 If you do not in adhere to these design specifications we will not be able to cut your design. 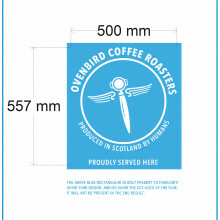 Your design will therefore be printed on a rectangular white film/sticker (6). Or cancelled. If your file does not properly upload or you need assistance. Contact us directly by email and attach your files, together with your wishes and wall film type and dimensions. 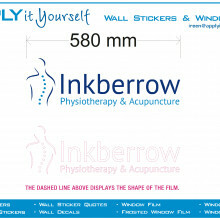 Above you will find our online wall decal designer in which you can design your own unique bespoke wall decals, to perfectly fit your personal and/or business needs. For large projects 50 m2 and up, we can supply you with over 13.000 different type/colours of vinyl. 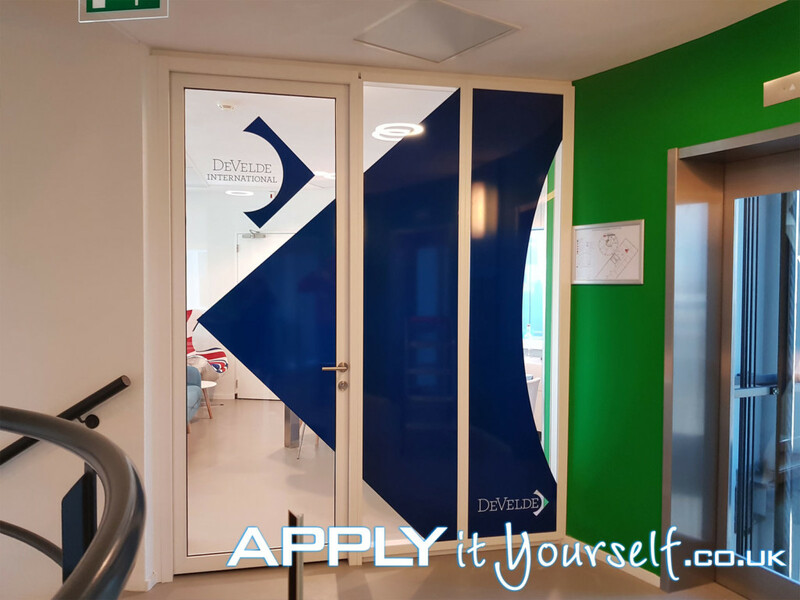 Your own bespoke wall decals will perfectly fit with your business (i.e., office, shop, restaurant) requirements or personal needs (i.e., home, front door, living room, kitchen, nursery, French doors, shower doors bathroom, children’s bedrooms). You can add the following elements to your own bespoke wall decal, patterns, designs, names, logos, quotes, lettering, family crests, etc. 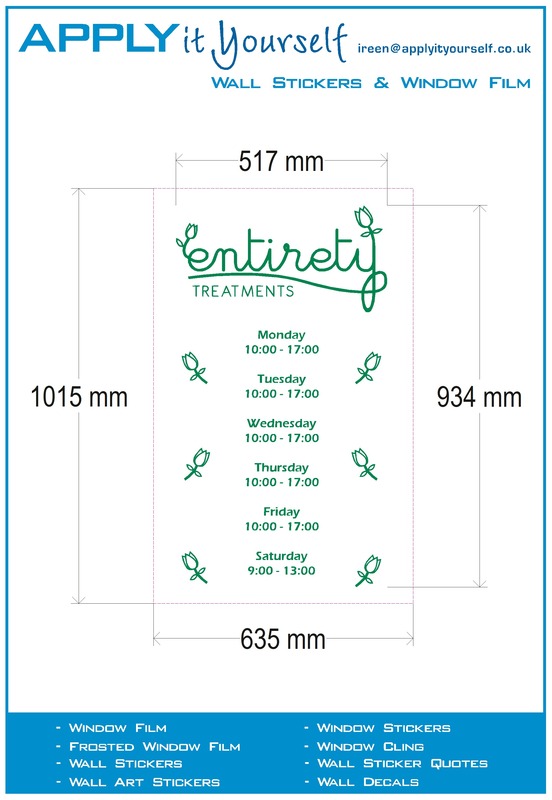 Enter this size in millimetres into the online designer, say 500 x 500 mm (NOT in centimetres or inches). 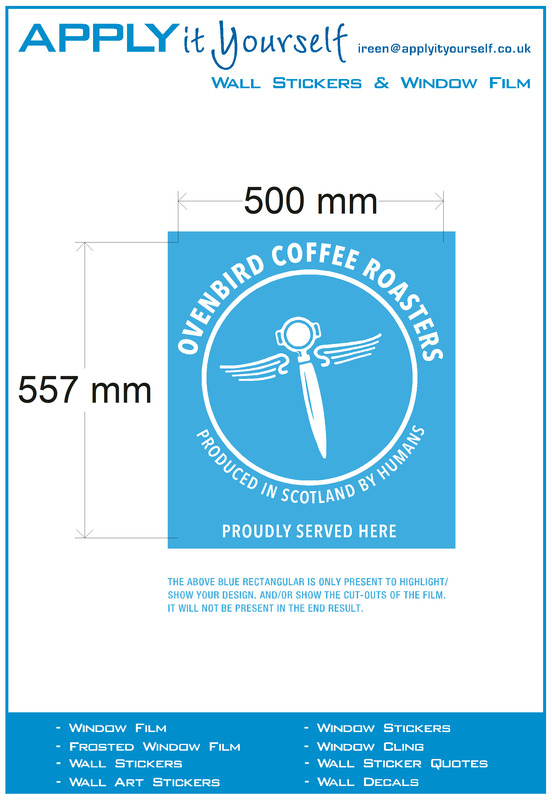 Maximum size 1180 x 3500 mm or 3500 x 1180 mm. If you are looking for larger custom wall decals. Or are looking for a large number of wall decal designs? Please contact us by email with your wishes, dimensions and designs/files/documents. Use only one colour. 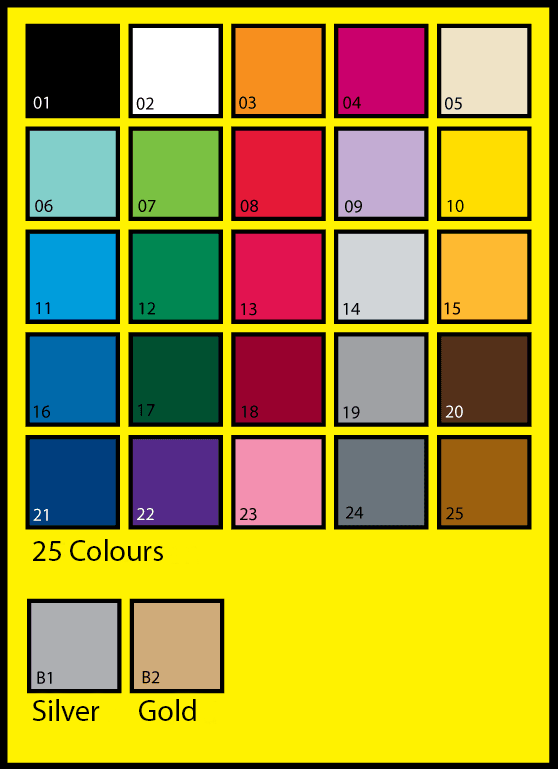 From the 25+ colours we have. See the designer for the most up to date colours available. If you already have you own design (as a vector based file in .ai/.eps.) which consists of multiple colours contact us directly by email. We advise you to use texts/lettering that is at least 50 mm high on walls. And avoid small elements as much as possible. Do you already have a bespoke wall decal design? You can use the “Add Design” button on the left of the online designer to upload your own custom design. Please check the design specifications if you logo/design confirms to the design specifications for vector based designs. You can use multiple different programs to design you own bespoke wall sticker design/logo like Adobe Illustrator, Corel CorelDraw, or Open Source software like GIMP or Inkscape. Make sure you are using a recent version of a modern browser like (Chrome, Safari, FireFox or Edge) without add-ons/extensions/plug-ins, like ad-block, no-script or ghostery or proxies that block certain domains. 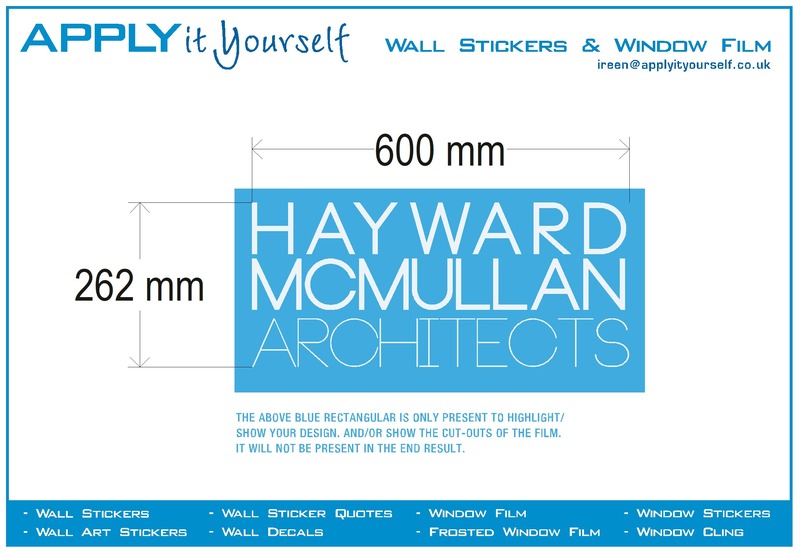 Below you will find an instruction video on how to use our online designer in order to design your own unique bespoke wall decal. There are at least 27 different colours of vinyl to choose from. All are colours are gloss unless explicitly stated that they are mat. See the online designer for a most up-to-date list of vinyl colours. For large jobs (at least 50 M2) we can supply you up to 13.000 different vinyls. Do not use more than 1 colour in your design. If you want to use 2 or more colours in your wall decal design, send us your design by email, to see if it is possible. Or design a wall sticker instead, which will allow for multiple multiple colours, gradients, etc. 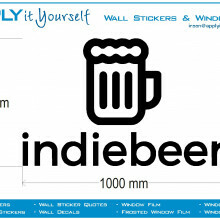 Your wall decals will be of professional high quality vinyl. For long (outdoor) durability. Highly weather, water and UV resistant. 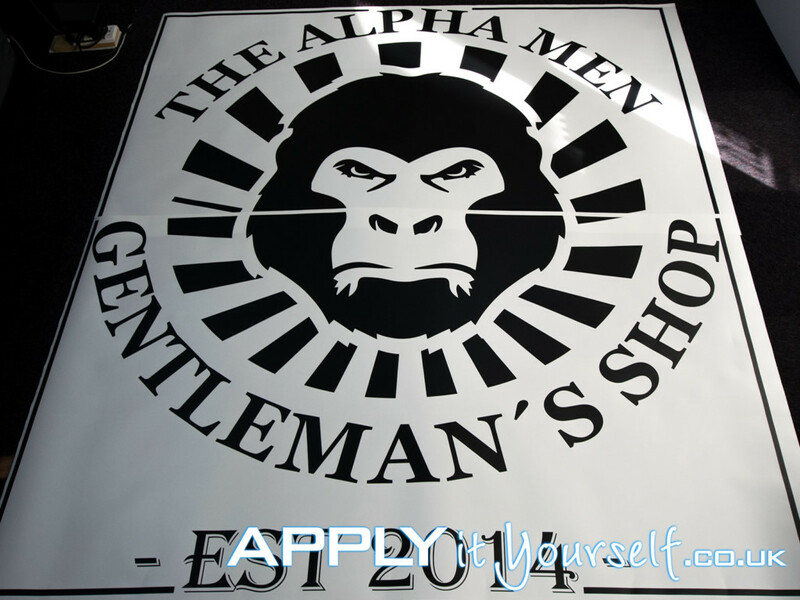 We specialize in custom bespoke signage for both businesses and individuals. Unique professional high quality signage solutions. 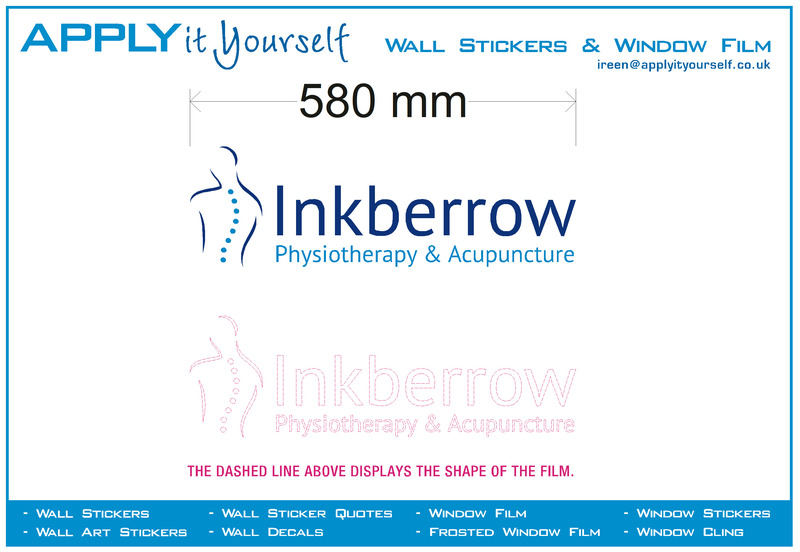 Your personalised wall decal solutions are made from high quality vinyl. Providing you with years of enjoyment. You will be supplied with a professional high quality, long (outdoor) durability, weather and UV resistant wall decal. The wall decals can be applied both indoors and outdoors. Make sure to thoroughly clean your walls, remove dust, grease and other dirt. 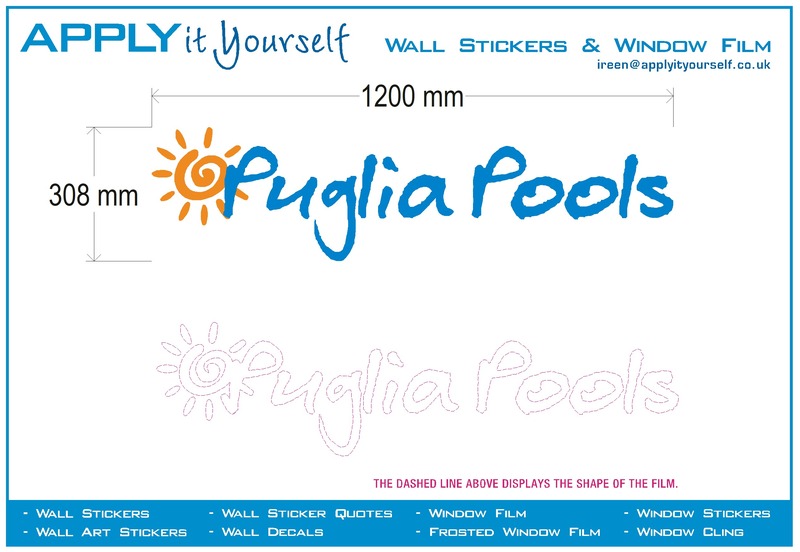 Our decals can be used on windows, walls or tiles as branding, advertising, or decoration. Window decals can also serve as a tool to inform and warn people. 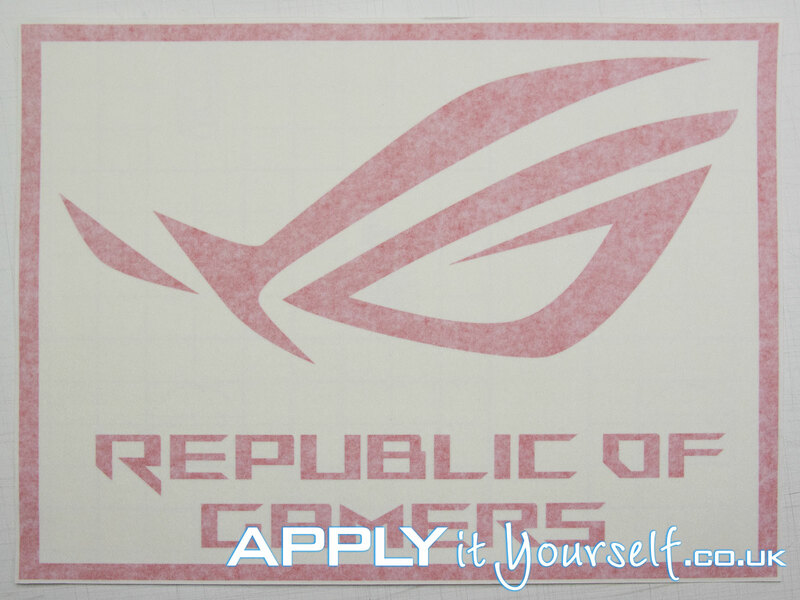 The front and back of your bespoke decal have the same colour. Your wall decal will be easy to apply yourself without any bubbles. 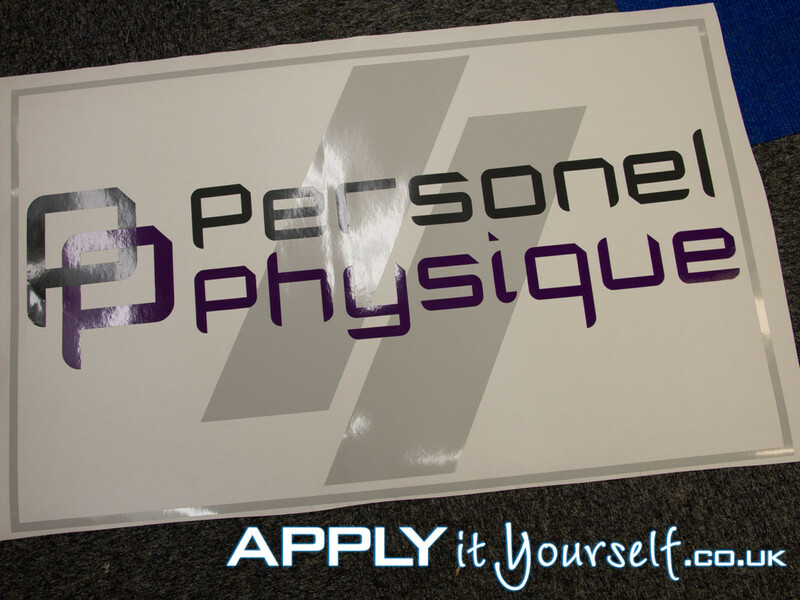 You will receive your window decal with transfer tape applied and a free squeegee. No additional tools required. 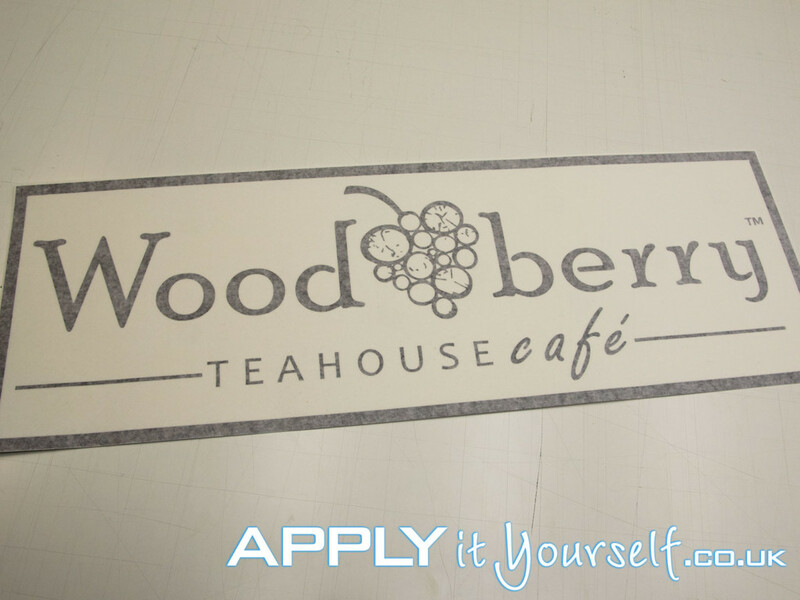 Only apply your custom wall decals on normal, flat, solid and smooth surfaces. Like metal (Aluminium, DiBond/ACP, (stainless) steel) non-oil releasing plastics (Acrylic, PVC/Forex, Trespa/HPL) and wood (laminated wood/hardboard). When applying in a wet/outdoor environment the surface needs to be solid (i.e., does not absorb water/liquids). Do not apply wall decals on walls which contain water/dirt repelling paints (i.e., paints containing teflon/silicone like substances). Do not apply wall decals on freshly painted walls, wait a couple of weeks for the water and other chemicals to thoroughly evaporate/dry out. Below you will find application instructions and instruction videos. Toggle the box below open by clicking on the plus sign. Your custom wall decal will arrive in a sturdy box (pre-assembled with the transfer-tape already applied) with a squeegee (free of charge). Ready for you to apply the own unique wall decal to your surface/wall. Always, first read, our extensive general information regarding application of our film. 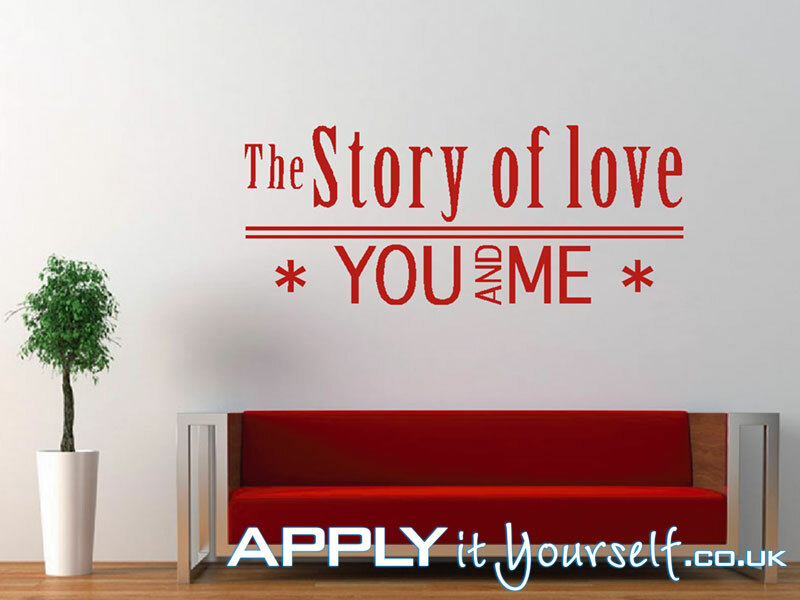 This will you find here, before your start the application/installation of your wall decal. You will also find the latest installation information there. 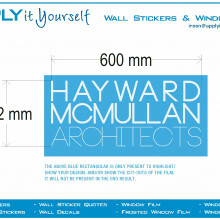 This part of the webpage, will teach you have to apply your bespoke wall decal. See our instructions and instruction videos below. Always, first read, our extensive general information here, before your start the application/installation of your wall decal. You will also find our latest and most up-to-date instructions at that webpage. 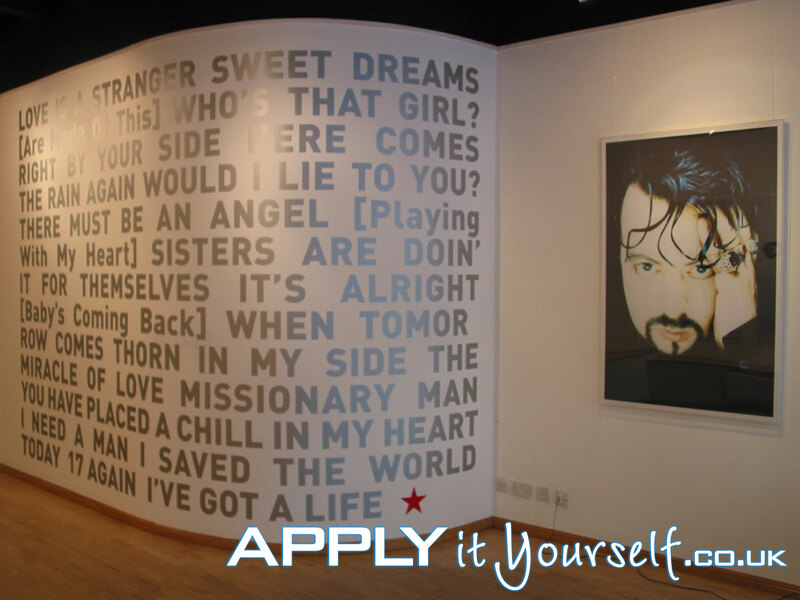 Below you find application instructions on how to apply your own bespoke wall decal yourself. Below you will find a large number of photos and examples of wall decals. Questions? Send us an email with your wishes, dimensions and designs (design specifications). Below you will find a number of wall decals designs for your business. C2. Photos of Wall Decals. Below you will find a number of photos of wall decals. More photos of both window and wall decals are available here.